Nokia is developing a phone that will utilize NFC technology, but not in the way normally thought of. The company is looking for “new ways to help us all reduce our environmental footprint.” To meet this goal, the Nokia Research Center supported by Nokia designers conceived the Nokia Eco Sensor Concept. 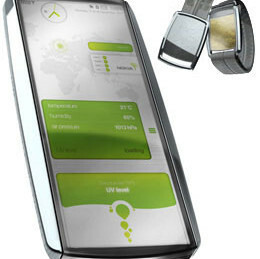 The visionary design concept is a mobile phone and compatible sensing device that will help you stay connected to your friends and loved ones, as well as to your health and local environment. You can also share the environmental data your sensing device collects and view other users’ shared data, thereby increasing your global environmental awareness. The concept consists of two parts – a wearable sensor unit which can sense and analyze your environment, health, and local weather conditions, and a dedicated mobile phone. The sensor unit will be worn on a wrist or neck strap made from solar cells that provide power to the sensors. NFC technology will relay information by touch from the sensors to the phone or to or to other devices that support NFC technology. All of the details can be viewed at Nokia’s Sustainable Products Site.